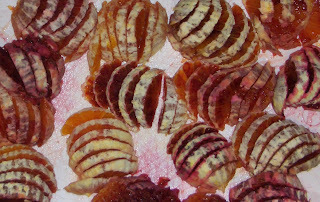 My first experience with blood oranges was in Italy, where they were as common as California navel oranges are in the U.S. We tossed them into salads and ate them for snacks. Every orange was a surprise, with flesh that might be plain orange, slightly rosy or brilliant maroon. Here they are, sliced and ready for a salad, a cacophony of crazy stripes in analogous colors. There is a quilt or some sort of fiber art in this photo, waiting to be born. When I figure it out, it will be delicious.